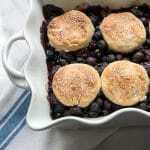 Three Berry Cobbler with Sour Cream Biscuits is a homey dessert great for all seasons. It’s easy to make and the biscuits can be made gluten-free or with gluten. We have been having a rainy, foggy start to spring. It’s welcome, don’t get me wrong, though unusual. Normally we soak up the sun on brighter days and cross our fingers the snow is gone for now. Mother’s Day is the arbitrary safe planting date even though we could still get some flakes in May. It’s been a cozy week in between showers. I realize I’m a bit of a human battery; boundless energy when the sun is out, and happy to hunker down indoors when it is gray outside. In the kitchen, lighter, fresher ideas have been popping to mind that warm the soul. 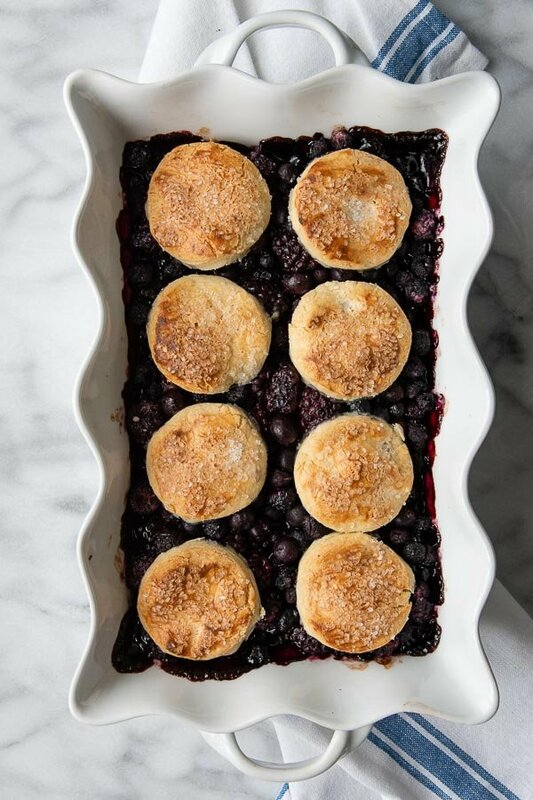 Enter Three Berry Cobbler with Sour Cream Biscuits. I love a rustic Americana dessert. They are easy, relaxed recipe that no one worries over how they’ll turn out. 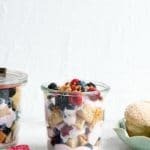 They are perfect for summer, featuring fresh fruits with some sort of topping or is in the case of a cobbler, a sweet biscuit layer that cooks along with the fruit filling. 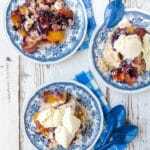 You don’t have to be a ‘baker’ to make a perfect cobbler! I’ve shared crisps, buckles, slumps, crumbles and pandowdy. 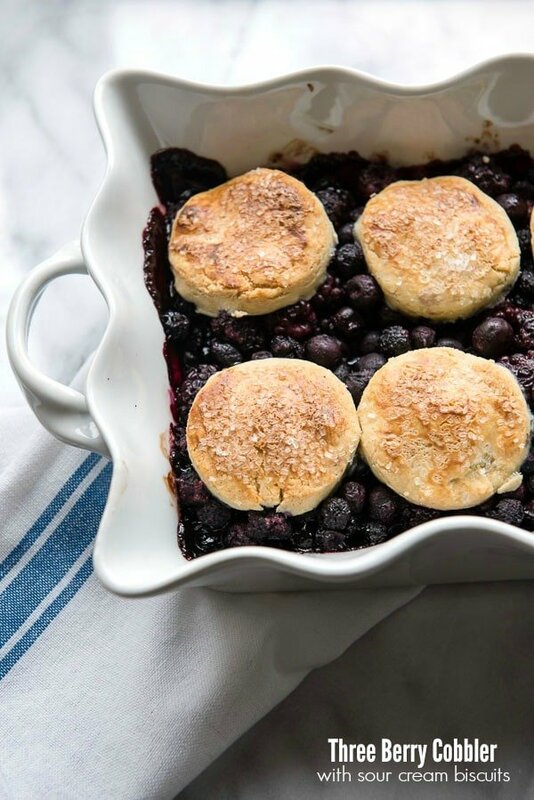 Cobblers are the quintessential summer dessert. They are unpretentious , allowing summer fruits to shine. In the case of this Three Berry Cobbler, blackberries, raspberries and blueberries ‘wow’ in the fruit layer. Cobblers are never met with ‘oh, no thank you, I’m just too full for dessert’. They conjure images of Grandmother’s kitchens, lazy summer evenings, rural landscapes and a slower pace. 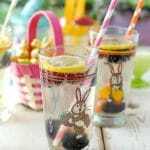 NOTE on the Berries: fresh fruits may be found all year round it seems but frozen, thawed berries can also be used. Easy Sour Cream Biscuits for the Win! 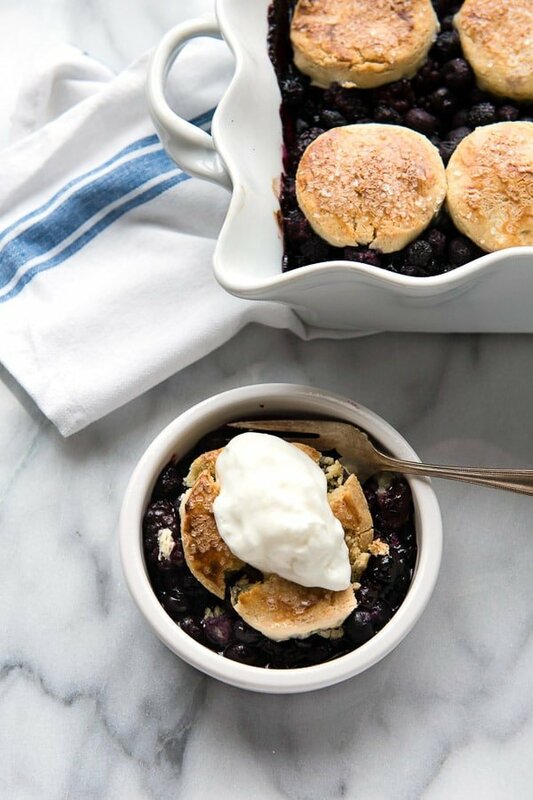 Three Berry Cobbler with Sour Cream Biscuits is not only a delicious way to enjoy fresh berries, but these biscuits are to die for. My version was made gluten-free however regular flour can be substituted. The biscuits are light, slightly sweet with a bright tang from the sour cream both in the batter and brushed on the top before being sprinkled with sugar for some sparkle. To make the berry cobbler I used a mix of fresh berries and berries I had in the freezer which I thawed before compiling the filling. Any mix of store-bought frozen and thawed berries, hand-picked frozen/thawed berries if you have them or fresh berries work great. It’s a very flexible recipe. I used up some Black Raspberries we picked at a favorite berry picking farm last summer which I was saving in the freezer for a perfect recipe. Cobblers are very easy to make and forgiving, unlike fussier desserts demanding precise execution. This is a perfect Sunday dinner dessert. 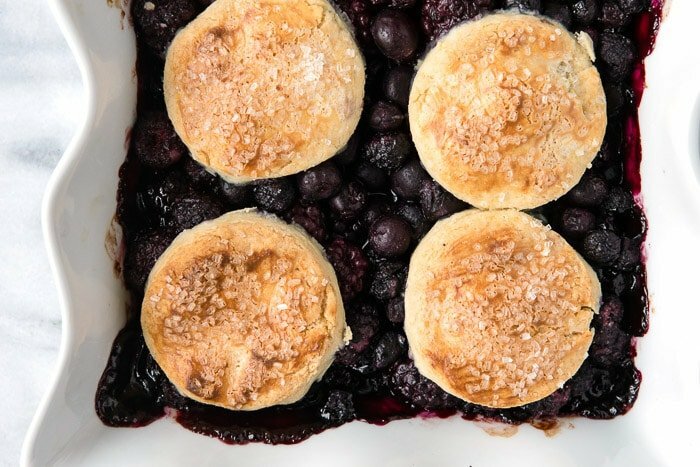 f you’ve tried this Three Berry Cobbler with Sour Cream Biscuits recipe or any other recipe on BoulderLocavore.com please don’t forget to RATE THE RECIPE and let me know where you found it in the comments below, I love hearing from you! Preheat the oven to 375 degrees. 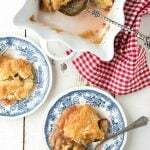 Cobbler may be made in an 8-inch or 9-inch square pan, or a 2.5 quart casserole or baking dish. Note: the biscuit dough may be made by hand or in a food processor with a dough attachment. In a large mixing bowl combine the flour, sugar, baking powder, baking soda; whisk to fully incorporate. Using a medium size grater, grate the cold butter into the dry ingredients. Toss with your hands to gently mix the ingredients or with a mixing spoon. Add the sour cream and heavy cream to the mixture and mix until all ingredients are incorporated. Biscuit dough may be rolled out and cut into pieces to cover the top of the cobbler or formed by hand. Combine the berries in a large mixing bowl. In a second mixing bowl combine the flour, sugar and lime zest; whisk to fully incorporate. Drizzle the lime juice over the berries. Sprinkle the berries with the flour-sugar mixture and gently spoon into the berry mixture to evenly distribute. Spoon berries into the baking dish, evenly distributed in the pan. Spoon berries into the baking dish, evenly distributed in the pan. Place the biscuits on top of the berries and gently brush with a thin coating of sour cream, followed by a sprinkle of sugar. Bake for 30-35 minutes until the biscuits are golden and cooked, and the berries are bubbling. Remove and allow to cool slightly before serving (berries layer will thicken as it cools). Serve with a dollop of whipped cream. I love the gluten free option here! I need more gluten-free options! This is my kind of dessert! So flavorful! This will be dessert tomorrow! I just got some berries and was thinking of what I could make with them. Problem solved. Thanks for the recipe. It looks really good! I love me some cobbler! I bet those biscuits on top make for a most tasty touch. Oh yes! Now this is my kind of dish. I can NOT wait to try it. I hope it comes out as good as yours looks. I’ve never actually made my own cobbler. IT’s pretty crazy! BUT This looks amazing. I think even I can do it. Your recipe looks sooo good! Hubby loves a good cobbler! I’ve never made a berry one!